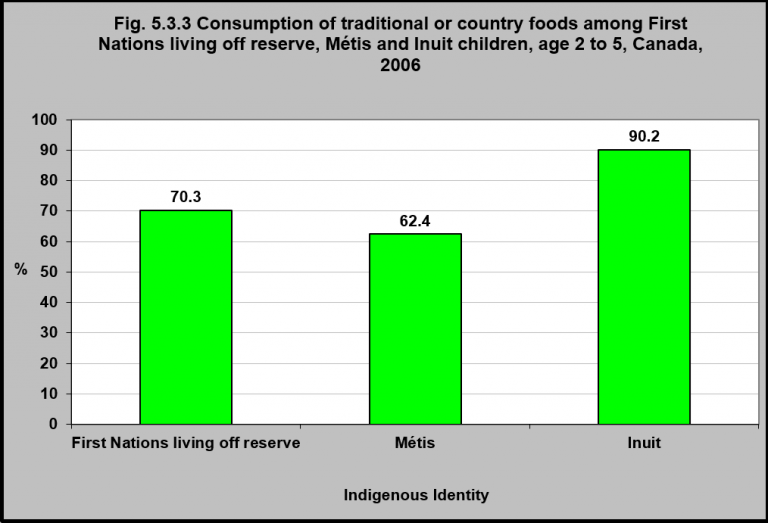 In 2006, traditional or country foods were consumed by First Nations children living off reserve (70.3%), Métis children (62.4%) and Inuit children (90.2%) aged 2 to 5. 1Statistics Canada. 2006 Aboriginal Children’s Survey. http://www.statcan.gc.ca/pub/82-003-x/2013004/article/11776-eng.htm-accessed August 22, 2017. Traditional or country foods are an important source of nutrients for Indigenous peoples and obtaining them provides physical activity, an active lifestyle and has socio-cultural benefits. While no comprehensive assessments of nutrient intake have been undertaken with Indigenous children, several studies have found that children who consume high quantities of traditional or country foods have fewer nutritional deficiencies than those who do not.2 Traditional or country food consumption, including plant-based foods such as berries, should be encouraged as part of a healthy diet for Indigenous children.